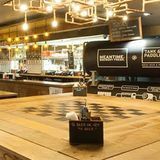 Tank and Paddle is a bustling bar offering a great choice of craft beers and handmade pizzas. Do you work at Tank and Paddle? What did you think of Tank and Paddle?